Today, I'm writing about the swashbuckler Captain Blood (1935), starring Olivia de Havilland and Errol Flynn. 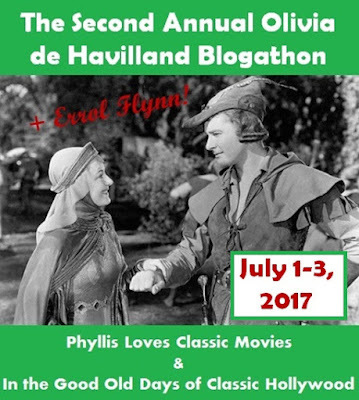 This article is part of The Second Annual Olivia de Havilland Blogathon + Errol Flynn hosted by Phyllis Loves Classic Movies and In the Good Old Days of Classic Hollywood. The 1935 pirate film Captain Blood is one of old Hollywood's minor miracles: The film made stars of Warner Bros. contract players Olivia de Havilland and Errol Flynn, set Michael Curtiz on the path to becoming one of old Hollywood's great directors, and revived the then moribund swashbuckler genre. Captain Blood begins when Irish doctor Peter Blood (Flynn) is mistaken for a rebel against the English crown while making night visit to a sick patient. Despite Peter's protests of innocence, he is arrested and sent to Jamaica as a slave, where, through a series of fortuitous events, he wins the favor of the governor (George Hassell) and romances the beautiful Arabella Bishop (de Havilland). However, when the Spanish navy attacks the island, Peter and a group of prisoners seize the Spanish naval ship and use it to begin a life of piracy. 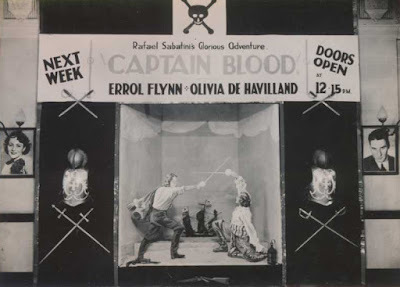 Captain Blood is based on a 1922 novel by adventure author Rafael Sabatini that had already been made into a 1924 Vitagraph Company silent film that starred J. Warren Kerrigan and Jean Paige. By 1935, Warner Bros. owned the rights to all Vitagraph properties, and studio chief Jack Warner, who was never one to waste anything he spent cold, hard cash on, decided to dust off the script and give it a sound remake. Warner wanted Robert Donat, who was then fresh off an international success in The Count of Monte Cristo (1934), to play Peter Blood, but the actor's chronic asthma caused him to turn the role down. Warner's tested several actors for the lead role, including George Brent and Leslie Howard, but they eventually decided on hiring Flynn, a strapping Australian newcomer to Hollywood, as the lead. Olivia de Havilland in a publicity still for Captain Blood (1935). Warner's also took a risk in casting de Havilland, another relative newcomer, as the beautiful and aristocratic Arabella. De Havilland, who had easily picked up film acting techniques during the shooting of her first movie, A Midsummer Night's Dream (1935), behaved like a seasoned pro throughout Captain Blood, but Flynn, who only had two brief appearances in B movies under his belt, was another story. The actor was extremely nervous during the early takes -- he was shaking so hard it could be seen on camera -- but several weeks of patient coaching by Curtiz paid off, and Flynn rapidly improved by the end of the shooting schedule. Despite the casting of Flynn and de Havilland, Warner's biggest risk was in Captain Blood's swashbuckling theme. During the silent era, audiences packed movie houses to watch Douglas Fairbanks cut a dash in movies like Robin Hood (1922) and The Black Pirate (1926), but costume dramas largely fell out of favor in the early 1930s in exchange for fast-talking gangster movies, risque comedies, and wisecracking musicals. However, the arrival of movie censorship in 1934 and changing audiences tastes -- The Count of Monte Cristo, The Scarlet Pimpernel, and Treasure Island were all big hits in 1934 -- almost guaranteed that Captain Blood was going to rake in the cash at the box office, although no one could have predicted the massive blockbuster it would become (estimates vary, but Warner's made more than $1 million in profits from Captain Blood). A theater advertisement during the original run of Captain Blood (1935). Viewed today, Captain Blood is still as fresh and exciting as it was on its first release. Curtiz, who would later helm such iconic Warner's films as Yankee Doodle Dandy (1942), Casablanca (1943), and Mildred Pierce (1945), moves everything along at a brisk pace. He masterfully directs several crackling action scenes -- the highlights are a beach-side sword fight between Flynn and rival pirate Basil Rathbone (clip below) and the climactic battle scene -- but Curtiz also excels at adding plenty of humor (mostly courtesy of Flynn's wisecracks) and romance to his films (courtesy of Flynn and de Havilland's crackling chemistry). I'll leave you with the Flynn-Rathbone sword fight, which, in my opinion, is better than their iconic duel in The Adventures of Robin Hood (a gentle warning that if you haven't seen the film, this clip does contain spoilers). Happy 101st birthday to Ms. de Havilland and happy Fourth of July to all my readers. Captain Blood is available on DVD and video on demand. I'm not one for swashbucklers, but it is impossible not to be enthralled by the ever-enthralling Mr. Flynn. I haven't seen this for quite a few years, but my kids are on a pirate kick right now, and they really like both Flynn and de Havilland because we watch Adventures of Robin Hood a lot, so I'm thinking I'll put this on next time we're all bored! Well, I didn't know that Donat refused the role because he had asthma! It was a very informative post. It never fails to amaze me how young and lovely Olivia is in this - and I agree that the sword fight is outstanding, maybe the only one inferior to Rathbone's and Power's in The Mark of Zorro. Next time I watch the film I'll have to pay more attention to Flynn's hands. I can't imagine any of those other actors in the role! And I agree about the sword fight. Thanks so much for participating in this Blogathon! Thanks for showcasing this wonderful film. What a way to start a career for Flynn. His next five years are going to be terrific. The next decade was hit & miss. Then all downhill. Rathbone had fencing training so Flynn scared him. Did not know what he was going to do next with a sword.